On Valentine’s Day, as the Bates Admissions staff is halfway through reading, re-reading, and re-re-reading every one of a record 4,506 applications for the Class of 2009, the topic of conversation in Lindholm House is the courtship between applicant and college. For starters, the College expects a certain love light in the eyes of each student who applies. “We want people who want to be here, who have a passion for Bates,” says Jared Cash ’04, assistant dean of admissions. “All things being equal, we want someone for whom Bates is at the top of their list,” adds Dean of Admissions Wylie Mitchell, who has been at Bates since 1978, four years before Cash was born, and has served as dean since 1995. Bates wants to be wooed, but the College is also a demanding suitor. The incoming class must number about 500 students evenly split between men and women, who represent worldwide human diversity, and also display the talent and proclivity to sustain 31 varsity sports, 89 clubs and activities (including art, dance, debate, theater, and music programs), and 32 academic programs. So while mutual attraction is the ultimate goal, the process is also a “competition,” Mitchell says, and for every acceptance letter mailed, the College sends three letters of rejection. This is what makes the admissions courtship an angst-filled affair for applicants and parents: the 3-to-1 odds against acceptance, never mind the stories in the media that depict the process as something more perilous than Shackleton’s South Pole adventures. 500: the target for the incoming class. As with any courtship, the final result, however magical, defies easy explanation. Associate Professor of Biology Joe Pelliccia is serving as a faculty fellow in admissions in 2004-05. 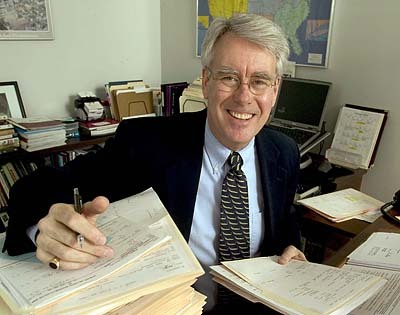 In late winter, he gathered with eight other admissions deans around a well-worn wooden table (a relic from Coram or Hedge, says Mitchell) for the discussion, debate, and decision on every applicant, whose credentials are reviewed three different times in the weeks leading up to committee meetings. “What was heartening was to see that, when all the data was in front of you” — the application, essays, grades, SATs if provided, recommendations, interview reports — “most decisions were pretty straightforward,” Pelliccia says. “For those cases that were on the fence, I was impressed that everyone’s voice mattered.” President Hansen, who sat in on one morning session, also noted the “painstaking” care given each application. Pelliccia captures the complexity — data and voices — and the Bates process, beginning with the interview, pays more attention to the voices. For instance, Bates is the rare college whose deans interview students both on campus and off, the latter during the fall season when they fan out across the country (visiting two dozen states during the campaign) and the world. Alumni-in-Admissions volunteers help out, too, and they conducted 541 interviews off campus this past cycle. Says Mitchell, “It’s the most significant instruction that Bates gives prospective students.” The numbers bear him out. Only 13 percent of applicants who do not interview are admitted. Applicants who do interview are admitted at a 44 percent clip. These tricks of the trade have a greater purpose — “the dignity of each individual,” in the words of the Bates mission statement, the very basic College ethos that also led Bates to abolish SAT requirements in 1984, believing, and ultimately proving, the test to be a questionable predictor of academic success. This ethos is also reflected, less famously but just as importantly, in a modest plaque in Lindholm House honoring namesake Milt Lindholm ’35, dean emeritus of admissions. “You looked beyond the credentials and saw the person,” the plaque says. In a Bates admissions folder, in contrast, the reader sees applicant-created materials first: the application and Bates supplement, the essay, and other personal materials. “We read these materials first and ask, ‘Who is this person? What do they do? What do they offer? How do they think?’” Mitchell says. Many schools require applicants to fill out a supplement to the Common Application, often asking for additional writing samples. Here, Bates poses a deceptively simple question: “Why, in particular, do you wish to attend Bates?” The query is another way, along with the interview and a campus visit, for Bates to know whether a student is truly interested or merely playing the field. Because half of all applicants apply to five or more colleges, and 10 percent apply to 11 or more schools, colleges like Bates increasingly measure applicant interest. In fact, every official contact a student has with Bates is chronicled in the admissions folder. The final item in the folder is the interview report, an all-important bookend. Like a pitcher who goes to his best pitch in a tight spot, the committee relies on the basics — applicant interest and compatibility — when decisions are close. The valedictorian from a tiny Maine high school who gets a good interview report and whose sibling is an alum is admitted. (At Bates, as at other selective schools, applicants’ family relationships to Bates are considered — especially in the case of “legacies,” children of alums. Typically, 20 to 25 legacy students enroll each year from an applicant pool of about 50.) Yet, the applicant who wants Arabic and business courses and expresses worries about the senior thesis in the interview goes on the waitlist.